Buddhist monks from Drepung Monastery’s Gomang College spent days constructing a sacred artwork out of sand, and when they were finished, they swept it away during a ceremony that included a moving tribute to one of Dickinson’s own. They had come to Dickinson from their adoptive home in India to serve a five-day residency on Buddhist principles, environmentalism and Tibetan culture. The residency included classroom visits, a cultural pageant, shared meals on campus and the construction of a mandala (Sanskrit for “circle”) in the Waidner-Spahr Library. Working in groups of four over the course of three days, each monk filled a narrow metal funnel, called a chakpur, with colored sand—tapping it gently to release a tiny amount of sand at a time, like ink from a pen—to create intricate, ancient symbols within a large circle. In the center was an image of a lotus, representing Green Tara, the goddess of enlightened activity, and as they worked, they invited Green Tara to come and bless the world with healing and peaceful energies. 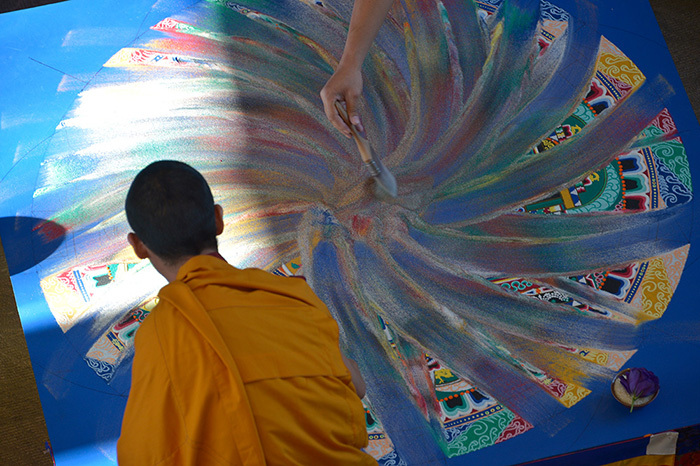 Just minutes after the painstaking creation was complete, the monks thanked the goddess and began to erase the designs by sweeping the sand into one multicolored pile, a ceremony symbolizing the impermanence of all things . They then deposited some of the sand in small plastic bags to be taken home by onlookers as a blessing. The rest of the sand was swept into an ornamental vase to be dispersed into a flowing body of water, which then carries the blessings forward. The monks poured the sand into the nearby Conodoguinet Creek as a tribute to Jigme Nidup ’19, a native of Bhutan who was of Buddhist faith, and who died while swimming in that area at the start of the fall semester. Daniela Aldrich ’19, a student in Associate Professor of Religion Dan Cozort’s Buddhism seminar, agreed and added that she was inspired by the monks’ sense of humor and joy. “I really had fun getting to know them, and by the end of the week, I was sorry to see them go,” she said. The monks’ residency was co-sponsored by the Clarke Forum and the Center for Sustainability Education, the departments of religion and East Asian studies, the Center for Service, Spirituality and Social Justice, the Waidner-Spahr Library and the Division of Student Life.